If you love brownies you need to try them as a pie. 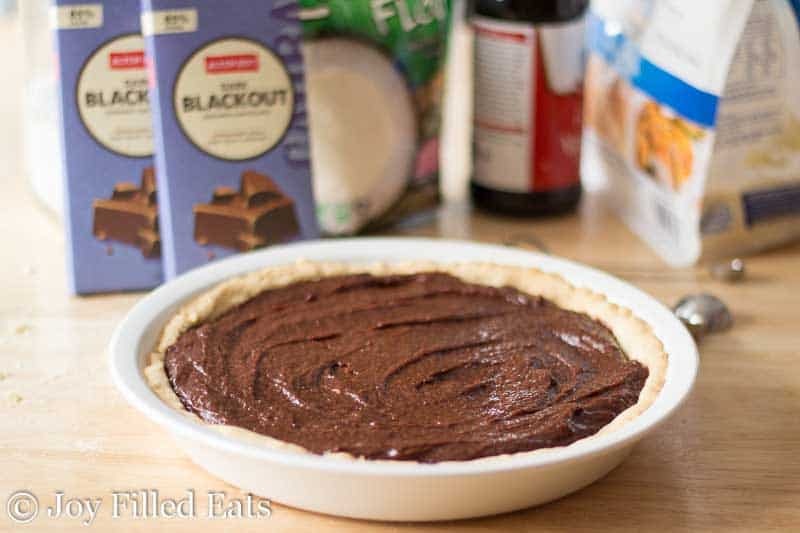 The contrast between pie crust and the chocolate filling is perfection. This Fudge Brownie Pie easily elevates a standard brownie to something elegant and worthy of fancy dinner parties. I am a collector of cookbooks. I must have over 100. Maybe even close to 200 if you count all the little paperbacks. One of my favorite cookbook authors is Bruce Weinstein who has a collection of Ultimate cookbooks. The Ultimate Ice Cream Book, The Ultimate Candy Book, The Ultimate Frozen Dessert Book, and several more. 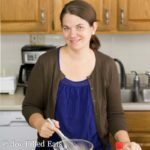 I’ve made many of the recipes in those over the years. One of my favorites is The Ultimate Brownie Book. And the funny thing is my favorite recipe from that book used a boxed brownie mix. 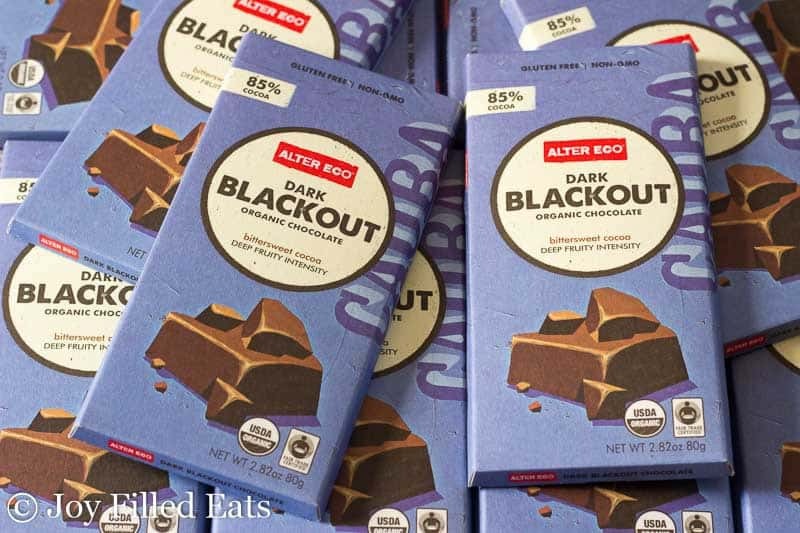 I’ve been thinking about reinventing that recipe for months and when Alter Eco Foods sent me a box of their Dark Blackout 85% Cocoa Chocolate Bars I knew it was time. 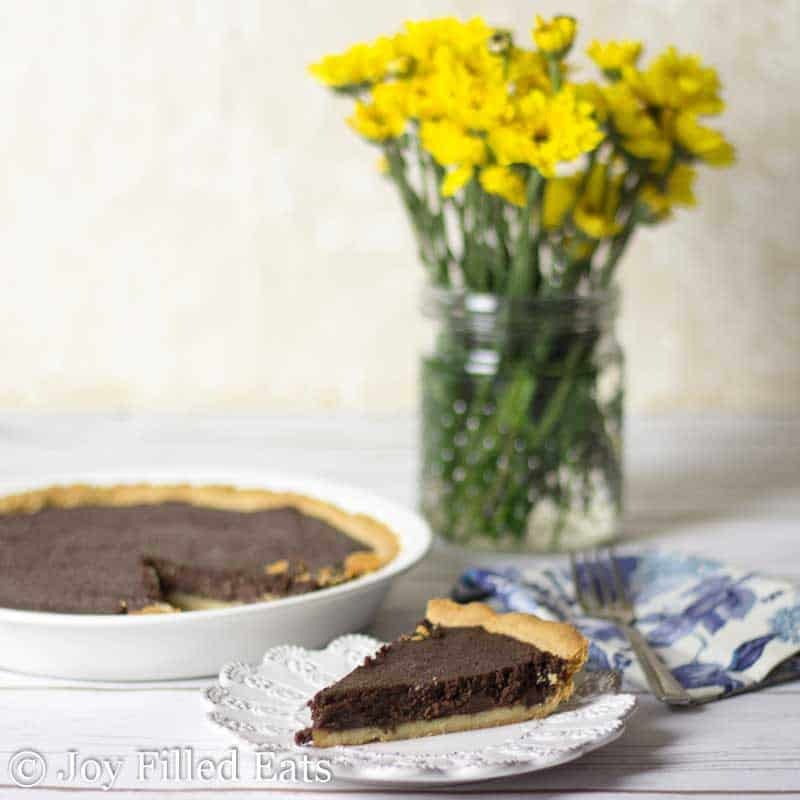 I normally eat this fudge brownie pie in my pajamas, on the couch, with a cup of decaf coffee. But if you throw fancy dinner parties this could be on the menu. If you love brownies you need to try them as a pie. 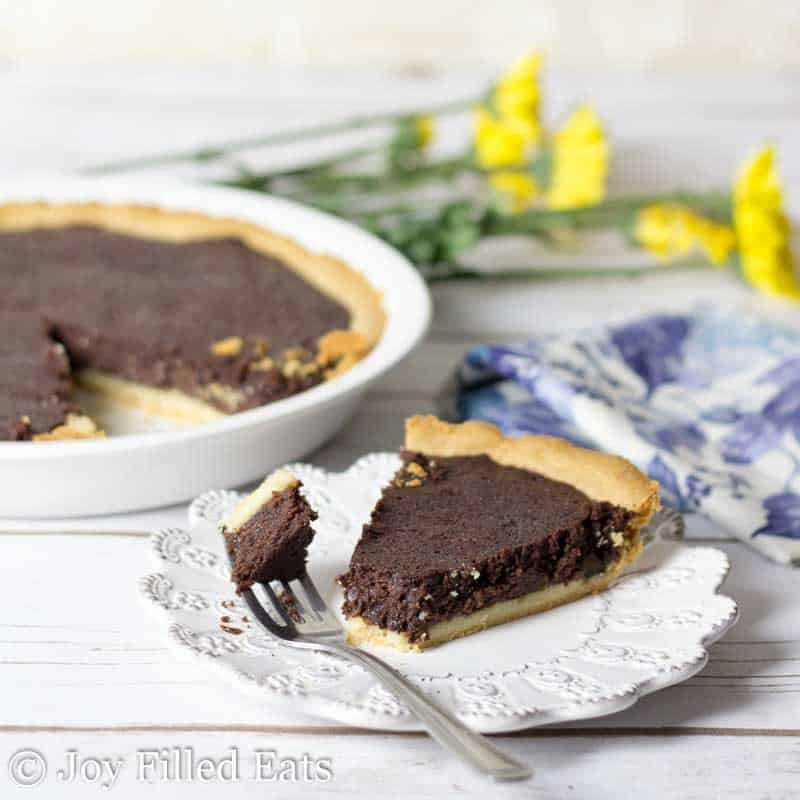 The contrast between pie crust and the chocolate filling is perfection. This Fudge Brownie Pie easily e.levates a standard brownie to something elegant and worthy of fancy dinner parties. Put the almond flour, coconut flour, and butter in a food processor and pulse until crumbs form. Add the water and pulse until it comes together in a dough. Press into the bottom and up the sides of a 9 inch pie plate. Prick the bottom with a fork. Bake for 10 minutes. Cool for 10 minutes. Meanwhile, melt the chocolate and butter in a glass bowl in the microwave. Add the sweetener, vanilla, flours, and eggs and stir until smooth. 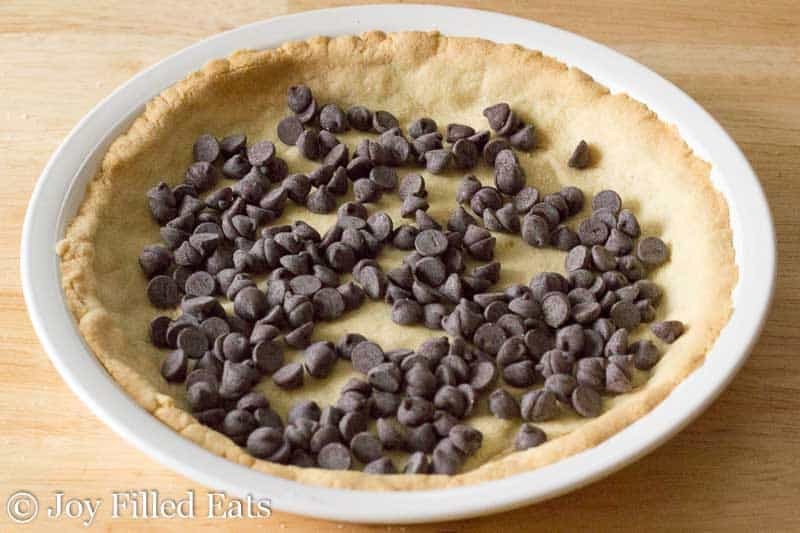 Sprinkle the chocolate chips on the bottom of the prepared pie plate. Spread the brownie batter on top. Bake for 25 minutes. Cool for at least 20 minutes before serving. How did you know I started a low carb diet? This was the perfect answer to my chocolate craving! My brother is gluten free, so this was the perfect pie for his birthday last week! Thanks so much for the awesome recipe! You had me at fudge! This pie is incredible! Hi! This sounds absolutely delicious. Any suggestions for a substitution for the Alter Eco chocolate bar? Thanks! Any 85% dark chocolate would work. You are speaking my language with chocolate! Love it! 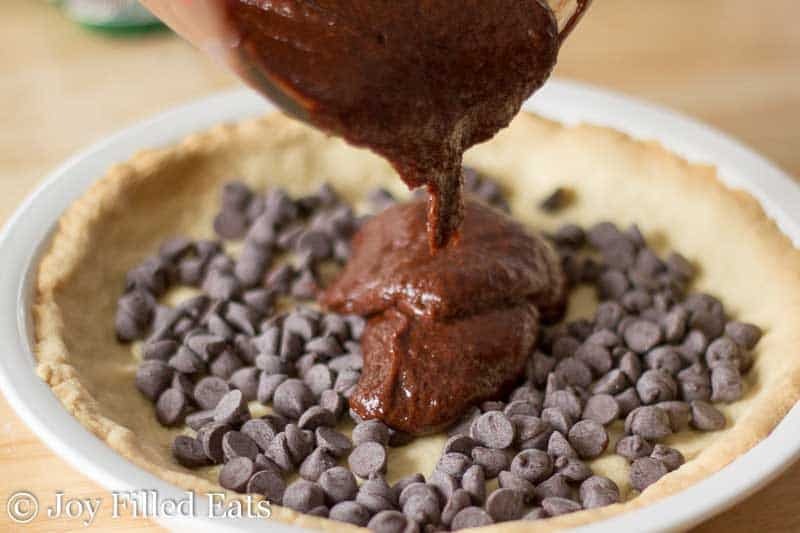 I LOVE chocolate and this pie looks like just the thing for me. My favourite is actually chocolate with 90% cocoa solids - super intense and so satisfying. Maybe alter eco could considering making one as well? This recipe looks delicious! I'd like to try swapping the Alter Eco dark blackout with the dark salted burnt caramel! Combining brownies and pie? GENIUS. This looks amazing! What is not to love here? Chocolate, brownie, pie. 3 of my favorite words! I am unfamiliar with the Gentle Sweet sweetener brand and also wondered what your mix was. Can you tell me where to find these? This pie looks amazing. Just like you mentioned, I bet the play in textures and tastes of the brownie and pie crust are just..... wow. I hadn't heard of this chocolate before. I will need to keep an eye out for it at the store. Thanks for sharing such a unique recipe.